John Ward Birge (1807-1873) was born in Litchfield, Connecticut. As an adult, he settled in Cazenovia, New York, and became a pharmacist, dentist, and state militia officer. He married Charlotte James (1809-1864) in 1832. In 1838, Birge joined the Hunters Lodge in Salina, near Syracuse, New York, and rose through the ranks to lead all lodges in Onondaga County. At the Hunter convention in Cleveland in September 1838, the delegates appointed him general of a Hunter division in upstate New York. The Hunters Lodge was headquartered in Cleveland. Birge and other New York lodge leaders wanted to fight and did not like being held back by the “westerners” in Ohio. Without any coordination or communication with Bierce and McLeod, Birge began organizing his own assault on Upper Canada. At a Hunters Lodge meeting in late October, Birge bragged to the assembled men that at least 20,000 fighters were ready to invade Upper Canada and set the Canadians free. Further, he assured them that 90% of Canadian colonists would flock to the Hunter banner, and 75% of Canadian militia would join their ranks. The Hunters lapped it up. Birge promised that any man who helped attack Canada would be granted 160 acres of confiscated Canadian farmland. It was a promise that backfired. Birge managed to attract a core of officers, whose bravery and competence surpassed any in other Hunter enterprises. Captain Daniel Heustis, 32, a veteran of the Hickory Island raid, became commander of the Hunter garrison in Sackets Harbor, New York. Martin Woodruff, 40, the sheriff of Onondaga County and a colonel in the New York State militia, became a colonel in Birge’s army. The most notable of Birge’s colonels was Nils Gustaf Ulric von Schoultz, 31, a man with aristocratic bearing and a colorful past. Von Schoultz was born in Finland, served in a Swedish artillery regiment, fought the Russians in Poland with Polish freedom fighters, and served with the French Foreign Legion in Africa. 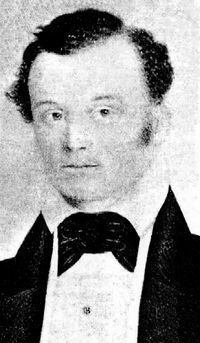 He married in 1834 and then abandoned his wife when he moved to the United States in 1836. He became a successful salt manufacturer in Salina, where he married again and joined the Hunters. There he met Birge. Von Schoultz promised 500 Polish exiles would join him in the effort to set Canada free. Some of Birge’s other senior officers were: Daniel George, 27, a teacher and senior Hunter, as paymaster; Dorephus Abbey, 47, a former newspaper publisher, militia officer, and Hunter leader, as colonel; and John Kimball, a Hunter recruiter, as colonel. His other captains and junior officers were Americans Lyman Leach, 40, a veteran of the Hickory Island raid, Christopher Buckley, 30, Aaron Dresser, 22, Sylvester Lawton, 28, and John Thomas, 27; and Canadian James Philips, 38. Birge also aligned himself with William Estes, 34, a self-appointed Hunter general, financial backer of Birge’s military campaign, and a New York State militia officer. One notable Hunter that Birge did not entice to join him was Bill Johnston. As Hunter admiral and local lodge leader, Johnston was surely privy to Birge’s plans. He may have offered advice but avoided aligning himself with Birge. Johnston didn't avoid that battle; he just participated on his own terms. When word of Robert Nelson’s Patriote assault on Lower Canada reached Birge, he set his battle plan in motion in hopes the British would be too distracted in Lower Canada to oppose him. A brief biography of von Schoultz.